There’s a town for sale, and perhaps Ted Turner, America’s largest landowner and Montana resident, may want to own a little bit more of “Big Sky County”. The historic town of Garryowen, Montana is for sale and due to be auctioned off sometime this spring. Home of the Custer Battlefield Museum, the town will be auctioned off by a Dallas auction house with a starting bid of $6.5 million. “This sale is a once in a lifetime chance to be an integral part of American history and to own the most famous privately held historic real estate in America,” said Gary Hendershott, consignment director for Heritage Auction Galleries. In 1993, Chris Kortlander purchased Garryowen and later mortaged the property to purchase the Elizabeth Bacon Custer manuscript archive. Wanting to build a museum in her honor, but unable to raise the money, he is now selling the property hoping that someone with the resources will follow his dream. Elizabeth Custer, was the wife of the famous Lt. Colonel George Custer. 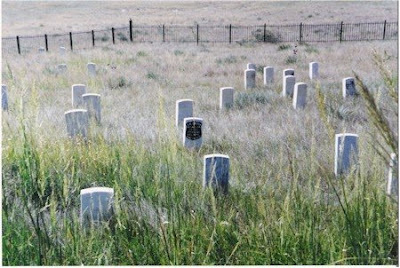 The colonel was slaughtered in the battle of Little Big Horn in June of 1876 along with 5 companies of the 7th calvary. Known as “Custer’s Last Stand” it was an incredible victory for the Lakota and Northern Cheyenne in the Great Sioux War of 1876-1877. 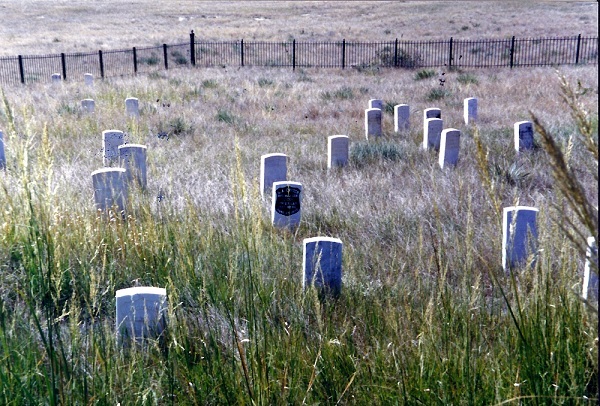 This picture shows Colonel Custer’s Grave marked in black. In August of 1998, David and I visited Little Bighorn Battlefield on one of our trips out west. M & E were just babies then and we were still looking for a place to relocate. It was a sobering experience not just because we were touching history on the battlefield but as a reminder of our nations bloody, warlike history. By the way, if you have an extra $6.5 million bucks hanging around, and are interested in the property, here are a few links to help you research the area. Things We Find Interesting Custer, Garryowen, Little Big Horn, M and E, Montana. permalink. Famous Yellowstone Elk, No.6, DEAD!! Perhaps, but the DoS doesn’t pass laws or legislate statutes that actually aid and abet Israel’s criminal behavior. What’s the terminology that governments like to use, “material support”?Well Congress is actually providing Israel material support. Til CamlonJeg fÃ¸ler at du har et grunnleggende pessimistisksyn pÃ¥ mennesker. Selv tror jeg Venstre burde bliklarere og fÃ¥ bedre fram hva Venstre stÃ¥r forog mener. PrÃ¸ve Ã¥ hjelpe folk til Ã¥ se hva som gagnerbÃ¥de de og sammfunnet pÃ¥ litt lengere sikt ennde neste 4 Ã¥rene. Hallo und GlÃ¼ckwunsch zu der tollen Zeit! Wenn du schon immer so nett unsere BeitrÃ¤ge verlinkst, muss ich ja wenigstens mal einen Kommentar hinterlassen! Das wiederholen wir dann nach dem 25.09., denn ich starte auch in Berlin… Weiterhin gutes Training mit viel SpaÃŸ dabei!